For as long as I can remember I have seriously suffered with sensitive and easily irritated skin especially on my body. I also have had eczema since I was a child which has flared up from time to time throughout adulthood. After a particularly bad bout of eczema in the winter months my skin always feels dry and very sensitive. I have a strict regime consisting of in shower moisturiser and a very thick, hydrating body butter, as well as regular exfoliating and buffing. I have been on the hunt for a product that will provide a bit of aftercare following using heavy steroid creams on my skin when I have bad eczema. 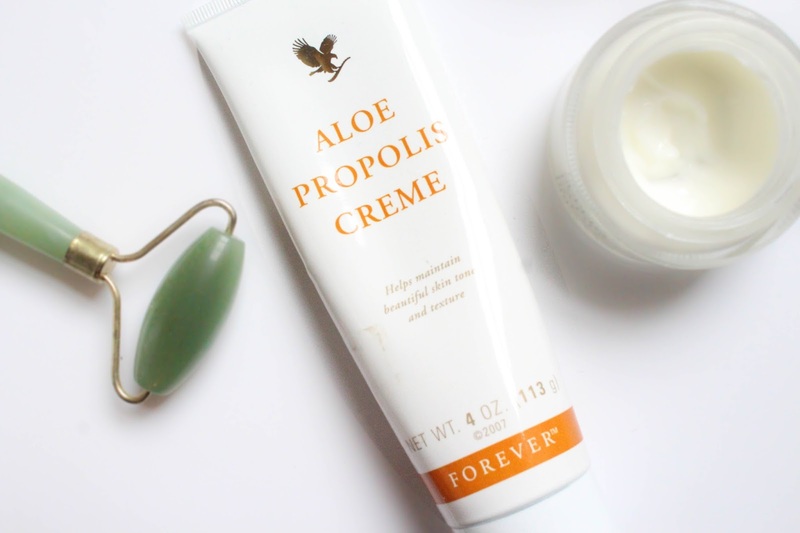 I came across Aloe Propolis Creme through a friend of my sister who works for Forever Living a natural Aloe Vera based product line. She heard the trouble I'd had with eczema and offered her basket of Aloe goodness for me to try out. 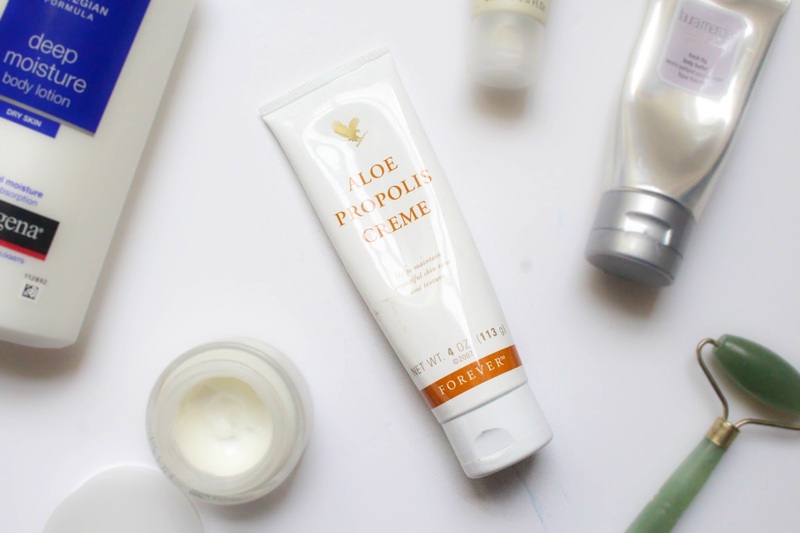 The propolis creme is definitely one of the stand out products I have seen pretty instant results from using it daily. The cream contains a blend of aloe vera, bee propolis, chamomile and comfrey that helps to hydrate and soothe irritated and dry skin. It also contains natural antibiotics which helps greatly if applied to small cuts and bruises. I have used this cream on patches of eczema and dryness, as well as small blemishes and cuts and have seen pretty fantastic results. Redness is almost instantly reduced and there is much less of an itch to my skin. Over a few days I have also noticed an improvement in my skin smoothness which is exactly what I need following a horrible break out. If you are suffering from any type of skin trouble such as eczema or psoriasis this cream could be such a great option for you. I know it is great for sensitive children's skin and is made of all natural ingredients and to top it all of the entire rage is cruelty free. I should use more skin care products! It's a worthy review. I will definitely try it out. Sounds like a miracle product! Oh I know this one, I used to steal it form my sister lol yes it's a really good product!